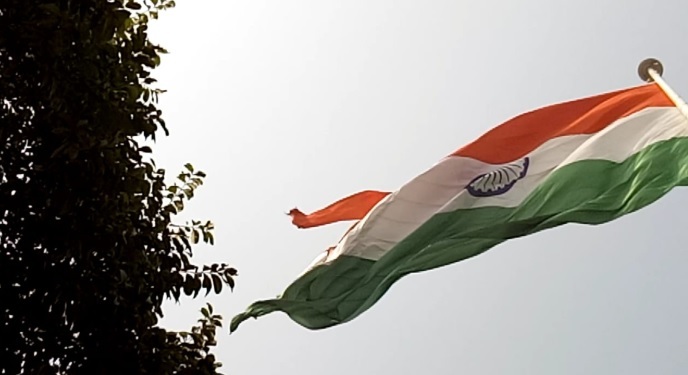 As the authorities concerned have failed to replace the national flag – which was flying in the country’s third tallest flagpole at the Gandhi Mandap atop Sarania hill in Guwahati – after it shredded recently, a resident in the city has lodged an FIR against the State Government. It has been reported that complainant Sarma, who is an engineer by profession, also hinted at possibility of a scam in the flagpole project. With a height of 319.5 ft and dimension of 120 x 80 ft, this is the third tallest flagpole in the country at Gandhi Mandap. It is indeed a national shame on Dipawali that the much hypedtricolouron the third longest flagpole atopSarania Hillsat Gandhi Mandap that adorned the Guwahati skyline of Assam has torn apart surprisingly within just one month of its inauguration. This is also a major embarrassment to the Assam Government that boasted of the iconic flagpole as part of its smart city project. The Sarbananda Sonowal Government had erected the country’s third highest flagpole at an estimated cost of whopping Rs 2.5 crore which was witnessed as damaged by onlookers early Wednesday morning and those at the helm of affairs are oblivious of this development. The tallest national flagpole with 360 ft height and with a flag of 120×80 feet dimension was installed along the India-Pakistan border at Attari in Amritsar while the second tallest Indian flagpole was installed at Kolhapur in Maharastra with a height of 303 ft.
Tata Consulting Engineers Limited completed the project under the Guwahati Smart City Limited. High strength steel has been used in the pole which was specially transported from Pune. The total project cost is Rs 2.92 crore which includes operations and maintenance for a period of one year.